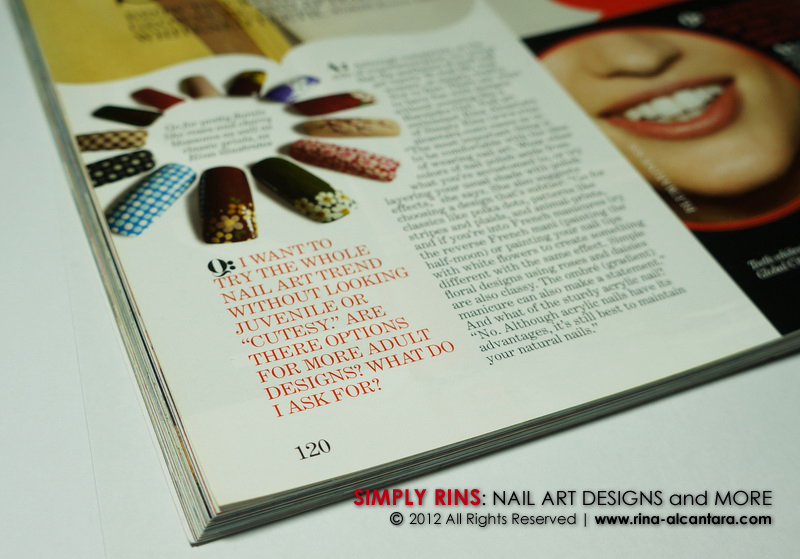 I answered a few questions to help write a nail art article included in the April 2012 issue of Preview Magazine. I was excited to get a copy and proudly share with you the write up. But when I finally bought the magazine and read it, I felt disappointed. Cover of the April 2012 Issue of Preview Magazine. It was the second time that Preview asked for my contribution as a nail artist. I declined the first invitation. They wanted me to come in and create nail art for a photo shoot. It would have been an amazing experience except that the pegs that they wanted can easily be done by almost any nail technician. They wanted a matte look, a reversed French manicure, a Louboutin nail art, and the like. Although the work would be compensated, I turned down the opportunity because I strongly felt that none of the pegs could represent my personal style. And honestly, I felt downgraded. It was like commissioning Picasso to paint a house wall. I am not saying that my skills are at par with the likes of Picasso, but if I don't believe in my own talent, who will? In their defense, they asked me to create a nail art of my style for one of the pegs to still include me in the project. I still declined the offer because I knew they feel that my nail designs were inappropriate for the magazine's market. The second invitation came last January 2012. My contact informed me that they wanted to further introduce nail art and I was up for it. The article focused on helping adult women to try nail art. Apparently, the younger generation is more adventurous into trying new trends like nail designing. As a nail art enthusiast, I believe that nail art is for everyone, young or old. If this article would help (in any way) for nail art to be accepted or to inspire people to try it, I would be delighted to take part on it. Sadly, I was appalled on how nail art was portrayed in this specific article. 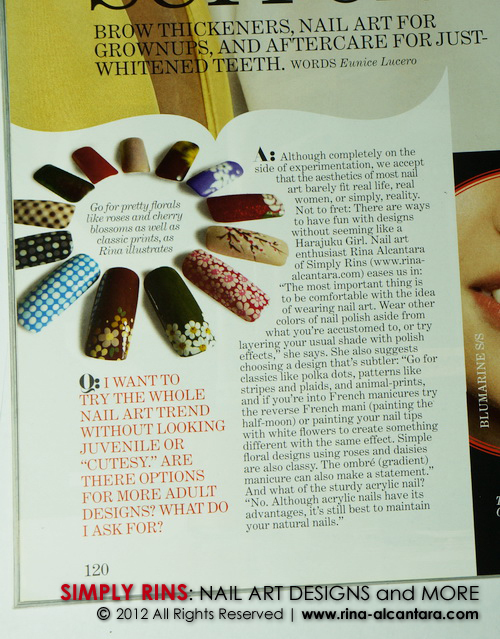 The nail art article was printed on page 120 of Preview April 2012. Before I accepted the invitation for the article, I asked them to view my nail art gallery first just to make sure that my nail designs are what they are looking for for the feature. They approved my floral nail designs and I recreated them on artificial nails, took photos of the designs, and emailed the files together with my answers to a few questions that tackled introducing nail art to women beyond their 30's and nail art trends. Full article about nail art for adults. Q: I WANT TO TRY THE WHOLE NAIL ART TREND WITHOUT LOOKING JUVENILE OR "CUTESY". ARE THERE OPTIONS FOR MORE ADULT DESIGNS? WHAT DO I ASK FOR? A: Although completely on the side of experimentation, we accept that the aesthetics of most nail art barely fit real life, real women, or simply, reality. Not to fret: There are ways to have fun with designs without seeming like a Harajuku Girl. 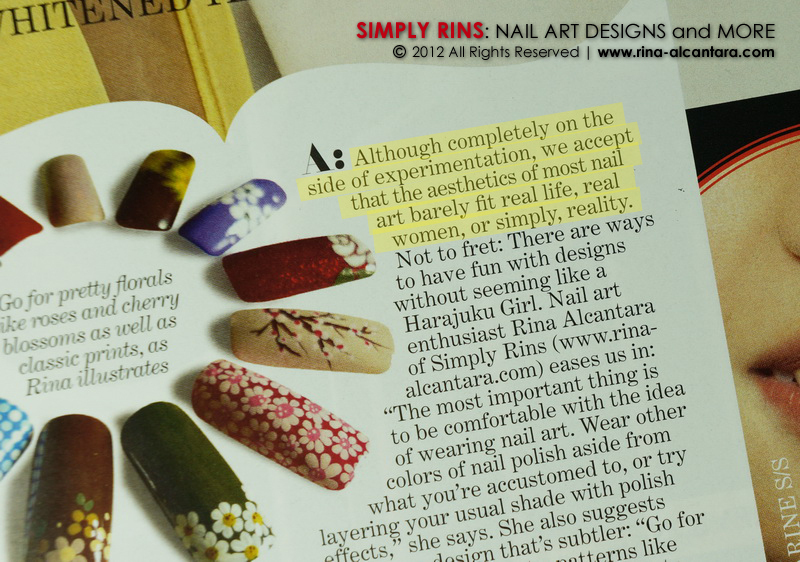 Nail art enthusiast Rina Alcantara of Simply Rins (www.rina-alcantara.com) eases us in: "The most important thing is to be comfortable with the idea of wearing nail art. Wear other colors of nail polish aside from what you're accustomed to, or try layering your usual shade with polish effect," she says. She also suggests choosing a design that's subtler: "Go for classics like polka dots, patterns like stripes and plaids, and animal-prints, and if you're into French manicures try the reverse French mani (painting the half-moon) or painting your nail tips with white flowers to create something different with the same effect. SImple floral designs using roses and daisies are also classy. The ombre (gradient) manicure can also make a statement." And what of the sturdy acrylic nail? "No. Although acrylic nails have its advantages, it's still best to maintain your natural nails." Note: Portions of my answers to their questions were enclosed in quotation marks. I think the short feature was good except for the first 2 lines of the answer portion. Although completely on the side of experimentation, we accept that the aesthetics of most nail art barely fit real life, real women, or simply, reality. Not to fret: There are ways to have fun with designs without seeming like a Harajuku Girl. I initially had mixed feelings when I first read it. So I reread it over and over and even asked a few friends for their honest opinion. In the end, I was still disappointed. I wanted to let it go but I personally felt strongly about it and I'd really want to share this experience with the nail art community and perhaps you can enlighten me if I misunderstood this text. Highlight on the first sentence of the answer portion was added by me for emphasis. A lot of women today regularly visits a nail salon to have their nails cleaned and polished. Some knows how to do it themselves at home. Regardless of how and where, women have included nail maintenance and applying nail polish as part of their lives. Coloring your nails is nail art by itself and has been becoming a common practice among more and more women everyday. Professionals are now becoming more conscious on how they present themselves and they understand that how they wear their nails is important for a good impression. But according to the writer of the article, most nail art are inappropriate (?) or unacceptable (?) by real women. How about this, I am almost 36 years old and I wore every single nail art design that I posted here in Simply Rins. My personal style have always been clean and defined lines and cartoony at most times as a reflection of my being a cartoonist. Based on the opening sentences, does that mean I'm being inappropriate with my nail designs because I am older? And what defines a real woman? What nail design should she wear? Nail art is a personal preference. How you wear your nails, polished plain or with nail design is an expression of who you are. Perhaps there are designs more appropriate for a specific occasion. Just like it is inappropriate to wear revealing clothes inside a church. However, as far as I can see it, there are no rules to nail art. Should there be? Are we not taught to respect individual choices? In essence, I think what the magazine article intended to say was that the most common nail art designs found here in the country are not yet widely accepted by older women and presented options. An option on how to become comfortable with nail art and an option of what nail designs to initially try. But I think that the first sentence to the answer part was a bit insulting to those who are already accustomed to wearing nail art designs across all ages, that includes myself. I should have asked for a copy of the article before it came out but I didn't. My answers were meant to help and inspire people to get started with nail art. I now feel irresponsible that I allowed my name to be included in a nail art article that I feel stepped on the prospects of nail art and my passion. I know that everyone is entitled to their own opinion and for that, I respect the author's points of view. However, I think the article should have been written without bias statements such the opening sentences of the answer portion since the feature included my contributions and I clearly do not believe in her opening statement. Please share with me your honest thoughts about the magazine article and about this post. I would really appreciate knowing what fellow nail artists or enthusiasts feel about all these. I understand your distaste with the article. The opening statement negates the whole thing. It would've been okay to qualify that nail art may not be acceptable in the boardroom just as blue nail polish is not. What is the point of writing and publishing an article on nail art for beginners and dismiss nail art entirely? That is a waste of time and resources. I'm sorry this happened. I love your nail art and you've inspired me to try new techniques. I really hate that this experience has left a bad taste in your mouth but I totally understand why. If the author would have left out that first paragraph the whole tone of the article would have been different to me. It does sound like a backhanded remark and almost like they're saying "it's still silly but hey let's give it a try". I do understand that a lot of "older" women (30 +) have a problem with nail art and different colors, I know because I was one of those people at one time. I have kept something close to my heart that my then 16 year old cousin said to me when I made a comment about being too old for blue polish. She said she hoped she never felt like that and she didn't think I was too old and I should wear whatever I wanted even when I'm old and wrinkled. My love of all things nail related pretty much started from there. I wear and have every color of the rainbow and I LOVE nail art of all types. I'm sorry you're feeling down about the article but try not to let it get to you too much. You are one of my biggest inspirations, I love your work. Just brush it off and keep doing your thing :). i agree with heather - it didn't make any sense for them to include the first part. in fact, if we step back and look at the sentence, it can even be applied to the fashion industry/ magazine etc on the whole. "the aesthetics of this magazine barely fit real life, real women or simply, reality"
i mean, how many "real women" actually buy all the makeup and clothes recommended in magazines? do people in "real life" actually wear high fashion clothes and pose in such a glamorous, artificial manner? i think what the writer was trying to say that nail art currently has a limited, small audience. but her attempt at making it sound sophisticated was kinda counterproductive. I believe the vast majority of over 30 are conservative. I actually find it hilarious and contradictory. I also think it will change...sooner rather than later. Rina: I also agree with you; the article is not done in good faith. If its a personal expression of one's being, it is meant to be as one wants. I do my mom's nails who is over 55 now and she still loves funky designs..so it depends on your nature as to how conservative one is or how open a person is with regards to expression of their self. This just goes to show the author of the article is "quite conservative" and cannot open his/her mind to the expression of art. So be it. BTW: I love that nail wheel..can u do a tut as to how you make those daisies..I can never seem to make a drop shaped petal like how you do? as I cant get the technique right..probably. And those polka nails r super cute..if I manage to make mine as clean as yours...i'll post it and dedicate it to u! That is why every time you write for a magazine or any type of media or attend to interviews or something like that, you should ask the full version of what will be published. The first sentence is really strange and I feel the same about it. I was a little offended by those opening lines as well. I'm a 30-year-old professional woman who also wears "crazy" nail art every day at the office. It doesn't interfere with my ability to work or do tasks and I have a constant conversation piece wherever I go. At first some people thought I was a little quirky for it, but now many of my female colleagues and friends are equally addicted to the creativity and individuality that nail art lets you express even when you're restricted by dress codes and age appropriate attire. I may dress like a conservative business person... but my nails reveal how youthful I still feel inside. I dont understand it either. I'm only 20 years old at the moment but I promise you in 20 years ill still be painting the same things on my nails and tryin every new trend that comes out. I agree with u and feel bad at the fact that ur name was included in that "mess" of an article. I read this article few times and I don't think that you misunderstood this text. What I want to say is that I have the feeling that I understood it the same way like you did, and like lot of other readers did. And I think that the first paragraph changes the whole tone of the article, unfortunately. It should have been cancelled before publishing the article.. Since this part of the article doesn't reflect your personal opinion about nail art, I can imagine how bad you can feel about this. Think about this as a bad experience, something that happened to you without your fault and I'm sure that next time you will try to do everything possible to avoid the same bad experience, hopefully finding people who will fully share your opinion. So, that anorexic looking model on the front cover with an endangered animal is reality? I don't get it. I wear wacky nail art and I'm nowhere near 30. I'm 62! I'm always leary of authors that use the royal "we," as in " we accept the esthetics...." That is not what we want out of nail art. We want FUN! Let's not be all judgey. Perhaps it would have been more acceptable if the author omitted the opening statement entirely because it put a bad note on the feature. I feel the same way when you said it's like saying "it's still silly but hey let's give it a try". I only hope the writer took into consideration those that are into nail art, regardless of status and age. And like you, I can still see myself wearing all kinds of nail art until I grow old. Here in our country, I believe that nail art still has a very limited audience. Most women are still conservative when it comes to decorating the nails. Sometimes, I feel that the author is trying to classify what nail art is "classy" and what is not. But this is a very subjective matter. Wearing cartoons on your nails can be classy to some, yet not to others. I think so too, that sooner or later more and more women will be open to wearing nail art or will be more adventurous in terms of colors. I believe that as well. Nail art will always be a matter of personal preference. Even if we are sometimes influenced by trends, it would still boil down to whether or not one is comfortable to wearing it. Yes, the writer seems conservative when it comes to nail art, but I still feel that she should have been more careful to writing generalizations. I'll make sure this will not happen again. I know that I am partially responsible for not asking for the full text. HI Rins, I wanted to chime in with you because I read your post/article and I can totally see your point. I'm an older 30 something, and yes I do Nail Art and some think that's s so little girlish of me. I am a professional, and am a parent too so I don't think there's anything wrong with having an interest in nail art at any age. I think you took the correct steps in being cautious the mag should review your work first before asking you to participate in the article. I think what should have happened is the should recognized your type of work, and then touch on your artistic talents. You're an artist, that's what sets you apart from nail shops that paint a flower on a customer. You're very passionate about each of your creations, and have a very amazing artistic value to your work. That opening does feel quite dismissive. I'm not sure what the author was going for there--perhaps she was frightened by some duck nails or something and let that influence her. On the plus side, the things you said were sensible and supportive and the art in the accompanying picture is beautiful. I'm betting a lot of readers will flip through and see the picture and be inspired just by that. I feel sad too that there are some people who puts a line to what you could wear on your nails. My mother is over 60 and she still rocked a simple snowman nail design last Christmas! Having my name in that article is partly my fault and I'll make sure something like that will not happen to me again. I also read the article over and over, just to make sure I didn't misunderstood it. I even asked a couple of friends to give their impression or understanding about that opening remark. It is really disappointing and somehow judgmental. I think that *some* nails designs are unwearable, but only the ones that stick up and are really crazy, but the article does make it sound like if you put anything other than a simple flower then you are way too over the top and childish. I think you gave a great answer, but I agree that it does imply that most designs are too crazy and immature for women. And if some people think they're too crazy, then they don't have to wear them and they definitely don't need to make their opinion known in a magazine article that could make some people look down at their nails and want to take them off because it says in a magazine that it makes you look like a "harajuku girl". And some people say to me when they see my nails that they are really cute and well done, but that they would never wear them, and that's fine, they don't have to. Just keep doing your amazing designs and don't worry about what they say. Rin, please keep doing your nail art YOUR way! As a 40+ nail art enthusiast (with asst pastel colors & white polka dots on her nails & white bunnies on her thumbs for Easter), I believe how one presents one's self is indeed a peek at one's inner self. Some of us are more flamboyant, some are more reserved. However one sees oneself, it's all good! I think the author of the artical short changed herself by starting her article by dismissing nail art as a valid personal expression. There are ladies out there that would like to do something different with their nails, but are afraid of change & the censure it might bring. That's something they have to overcome on their own, but encouraging them to try something as temporary as nail art is a good 1st step to self expression. I thought it was quite dismissive too. I guess the author's point of view as regards to wearing nail art is an indication that nail painting still have to a lot of growing to do. Thank you for your thoughts on this matter and yes, I hope that the nail designs I provided for the short feature will be enough to encourage people to try nail art. I find it's the fear of the unknown, or the unfamiliar, that women have the biggest uncertainty about nail art. I don't like how the author brought up age as a defining point regarding nail art, I'm 35 & I've been doing all kinds of nail art on my hands for over a decade. If I had to discuss the "age" factor I'd respond with the fact that every woman, no matter her age, has that fun teenager inside of her that they may have lost along the way & being a Nail Artist I love being the one to bring it out. I throw girl movie/nail nights every other week & at first I only had a couple friends that were willing to let me get creative with the nail art, now the group has grown to about a dozen! It's like the first time your going to get your hair cut or colored, that same uneasy feeling of "how's it going to look?" "are people going to like it, hate it or think it's silly?" "will it suit me & my life, or look out of place?" I always tell them, You gotta try it at least once, what's the worst that can happen? I love creating nail art, whether it's on my own hands or someone else, it's about art & creativity & individuality & I think it's brings out a lot of character in a woman who is adventurous enough to let that inner "FUN" out to shine. Each woman's taste is so unique, some love flowers, you might be into polka dots, some want simplicity & others I can be more creative with & pretty much have full reign to do whatever I please. There are so many lovely ideas out there that there is something that is perfect just for you, I guaranty it! I love your blog Rins & I hope, like you, that more & more people will be encouraged to give it a try at least once in their life. It's such a lovely display of individuality & art that I can't imagine anybody that would think it's anything other than pure creativity & beauty. personally I think you're overreacting... of course nail art isn't for everyone, it's for the bold and daring! I think you should have made some more grown up designs for the magazine because cute flowers etc aren't suited for the audience of adult women. I appreciate all types of nail art and I think that everyone that's into nail painting has the right to choose the style she prefers or what suits their lifestyle. I guess it just boils down to respecting the choices of others and not be judgmental, which I believe the article did not exhibit based on its opening remarks. It is just so sad that my answers to certain nail art questions were used in a feature that somehow broke my heart. Yes, I believe what other people say is still a big deal to how women wear their nails. But I'm sure that sooner or later, people will realize that nail art is an expression of individuality and an expression of self-confidence. The nail designs that I submitted for the article were actually approved and requested by the author. I specifically asked them to browse my gallery first before I commit to the collaboration and she thought my floral nail designs were appropriate for the article. I guess your comment just made it clearer that what nail design to wear is really a matter of personal preference. I think you're overreacting, they are not dissing you or people who wear art on their nails, its just that when they think of nail art they imagine its the glamtastic acrylic designs with all the "bells and whistles" so to speak that are usually more displayed im not sure if that the right word. WHat you are doing is just in-between to them , I imagine thats why they asked you to contribute and I don't think you should be so offended. I hope your assumption is correct regarding the author's impression on nail art. I also hope that she made that clear in the article to avoid different interpretations.